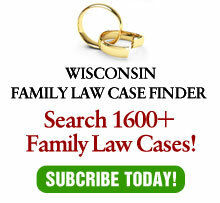 Under Wisconsin divorce law, the value of property is normally determined as of the date of the divorce. As a result, there is little incentive to increase the value of the marital estate that a party will have to share with a soon-to-be-ex-spouse. At the same time, a party who dissipates assets during the divorce can held accountable for the waste. A recent Wisconsin court of appeals case clarifies the line between dissipation and acceptable financial conduct. In Noble v. Noble, No. 2004AP2933 (Sept. 21, 2005) (recommended for publication), the court of appeals affirmed a judgment rendered by the Racine County Circuit Court Judge Faye M. Flancher (Racine County Cir. Ct.) which denied the marital waste claim of the wife, Deborah Noble. The husband, Danny Noble, was an equal partner with his brother in a farming partnership that harvests and sells grain. During the pendency of the divorce, Danny’s brother, Dale, and Dales’ wife purchased three properties, titling them in their names, but not including Danny. Prior to the acquisition of the three properties, standard practice for property acquisition had been to withdraw partnership funds, purchase the property, and title it in one-third shares which included Danny. However, Danny was excluded from this purchase due to his marital problems and his fear that his wife’s erratic behavior might interfere with property acquisition. The trial court rejected Deborah’s claim that Danny and his brother engaged in misconduct, warranting inclusion of the value of three properties in the marital estate. The court noted that one property was not available to the general public and the other two were important given that they are adjacent property and Dale did not want to risk losing it due to Deborah’s uncooperative behavior. The trial court noted the partnership was repaid by way of rental income (or rental income savings, to be accurate) and that the transaction was “nothing other than a sound business decision.” Deborah appealed. The court of appeals, in a unanimous opinion authored by Judge Daniel P. Anderson, rejected Deborah’s marital waste argument. The court held that there is no requirement that a “party take advantage of an opportunity to acquire property that would increase the value of the marital estate.” Wis. Stat. § 767.255(3) and 767.275 are intended to prevent squandering, destruction or unjustified depletion of marital assets, which did not occur. The court noted that divorce attorneys frequently (and “wisely”) advise clients to avoid acquisition of marital property when facing a prospective divorce. Recently in this column, commenting on Derr v. Derr, 2005 WI App 63, I expressed a warning that the court of appeals decision in that case not be read to allow a trial court to find dissipation in a case where a legitimate investment goes sour. (See “Potential Derr v. Derr Problem,” Wisconsin Law Journal, April 20, 2005.) Such a rule would create havoc in divorce trials by requiring courts to penalize a party due to no fault by that party. Similarly, if a spouse were required to take all steps available to increase the marital estate, family courts would be placed in an untenable position. There is an unending list of possible investment opportunities, the success of which is only known in retrospect. As the court in Noble implicitly found, there is a difference between forgoing opportunities which might increase the marital estate and affirmatively taking actions to reduce it. The latter is prohibited by Wisconsin case law. See Anstutz v. Anstutz, 112 Wis. 2d 10, 331 N.W.2d 844 (Ct. App. 1983). The former is, fortunately, not required. If the court in Noble had ruled differently, trial courts conceivably could be called upon to assess every financial opportunity to ascertain the effect of the decision on the marital estate. The result, in addition to inundating trial courts, would place an intolerable burden on them. As the appellate court noted, divorce lawyers frequently (and wisely) counsel clients regarding the effect of business decisions on the divorce. This advice, however, is not always to avoid acquisition of martial property. Rather, frequently, the advice is to understand the implications of such acquisition. However, ethical divorce lawyers (which fortunately comprise the great majority) also counsel clients to avoid active dissipation. The difference is clearly understood by divorce lawyers in the vast majority of cases. Trial courts understand the distinction as well, and, thanks to the court of appeals decision in Noble, can rule appropriately.